This fruit punch recipe is very easy to make, with frozen orange juice and lemonade concentrates, pineapple juice, and ginger ale. This is the perfect fruit punch for a party, and it's nonalcoholic. Add fresh citrus slices for an extra-special look. 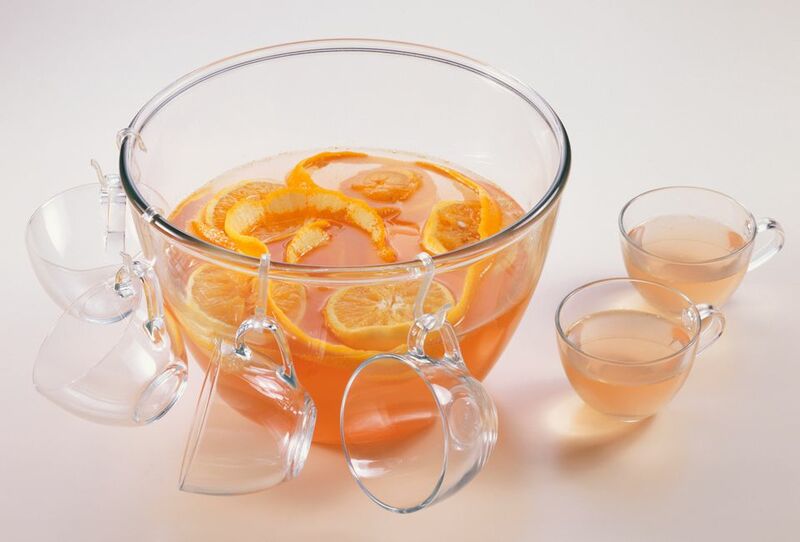 The recipe makes about 3 quarts of punch, and it is easily doubled for a larger party. For an alcoholic punch, add about 1/3 cup of light rum to the finished punch mixture. Mix fruit juices; cover and chill thoroughly in the refrigerator. Add cold ginger ale just before serving. Serve the fruit punch over crushed ice or freeze about half of the ginger ale in ice cube trays and add to punch with remaining ginger ale. If desired, add slices of lemons and/or oranges just before serving. Combine the punch ingredients as directed in the recipe. Layer slices of fresh oranges and lemons in a ring mold. If desired add berries with a contrasting color, such as red grapes or blueberries. Other possible additions: sliced kiwi, mint leaves, violets, rose petals, or pansies. Fill the ring just level with the fruit with the punch mixture. Or use water if you prefer. Once the ring is frozen, add another inch of punch or water and freeze. Continue adding one inch at a time until it is as thick as you want. You can use a Bundt cake pan if you don't have a specialty mold.